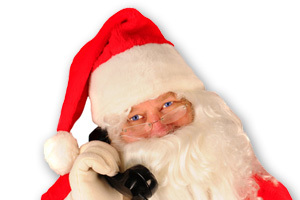 Awesome…I’ve been looking for this for ya…it’s this year’s way for Santa Clause to call your kids on the phone! Last year, I just had a number for you to call – but Google/Gmail has set up an awesome program this year where you can personalize the message – it’s VERY cool! After you fill in the drop-menus, you can listen to a test and then go back and revise it…but I took an audio recording of test I did so you can listen to a demo by clicking here (remember to turn the volume down so the kids don’t hear it)! Enjoy, Everyone! p.s. – you can also call and listen to Santa’s outgoing message and then leave him a voicemail by calling toll-free to (855) 34-SANTA.